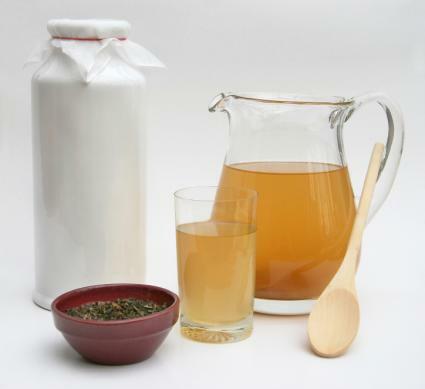 The recipe for kombucha tea uses tea in combination with a variety of bacteria and yeast. In recent years, it's become a popular drink touted as a cure all for a host of maladies. While many health benefits are claimed by those who drink kombucha tea, it's important to note that these claims have not been substantiated. However, that's not uncommon in the world of herbal remedies and individuals have used the beverage for years and swear to its effectiveness. While kombucha tea is available in health food stores, online stores, and a few other outlets, it isn't always readily available. It can be easier and less expensive to brew your own tea. If you decide to go this route, the ingredient that's hardest to find is the kombucha culture. Don't rush it. Wait long enough for the tea to ferment properly. Be careful to add the right ingredient amounts (too much of an ingredient can throw it out of balance). Don't ferment for too long. If you're making your first batch of kombucha tea, it's best to start out small until your culture grows enough to support bigger batches. Make your tea using two teaspoons of tea in a quart of freshly boiled water. While green or black tea is recommended, you can also use herbal fruit flavored teas for a unique fruity flavor. However, if you're drinking the tea for medicinal reasons, green tea is said to prevent the growth of cancer. Strain the tea from the pot (or remove tea bags). Add the sugar to the infusion while it is still hot enough to dissolve the sugar completely. Let the mixture cool completely. If you add the culture into tea that is still tepid it can kill the kombucha culture. When the mixture reaches room temperature, pour it into the jars (fermentation containers). If you don't have glass or porcelain, stainless steel, glazed earthenware or china may be used. Kombucha tea is acidic and should not be placed in containers that may react to the acids. When making your first batch, add the liquid you received with the culture. Once you've made your first batch, always save about ten percent of the mixture as a starter for your next batch. Add kombucha culture. The culture grows and will develop over the surface of the tea where it thickens in layers that can be separated. This makes it easy to peel the layers apart and use them in individual jars when making more kombucha tea. Cover the jars using the a tightly-woven fabric (but porous) or paper towel. Secure the cover with a rubber band. This keeps out pollutants including fruit flies and their eggs. Air still must be able to circulate. Wait eight to twelve days. The fermentation process will depend on the temperature. The warmer the room, the quicker your tea will ferment. (Ideal temperature range is between 74-85 degrees Fahrenheit.) Place the containers in an area where they will not be disturbed because once fermentation begins, they should not be moved. It doesn't matter if you put them in a dark closet or in a laundry room with a window. It doesn't need light to ferment, but avoid bright sunlight as it can damage your mixture. When the tea is done fermenting is a matter of individual taste. The pH level should be between 2.7 and 3.2. Remove the culture (be sure to wash your hands first). Rinse the kombucha culture under cold water and place it into a new container of tea immediately. Pour your finished product into bottles all the way to the top. Don't forget to put aside your portion to use as a starter for your next batch. Close bottles with a tight-fitting lid that seals. Let the tea mature for at least five days before drinking. Once you're tea has matured, you can enjoy its fizzy, slightly-sour taste three times a day. Recommended amounts vary. .